CT : New Haven Co.
July 22, 1986, LG Crabo. 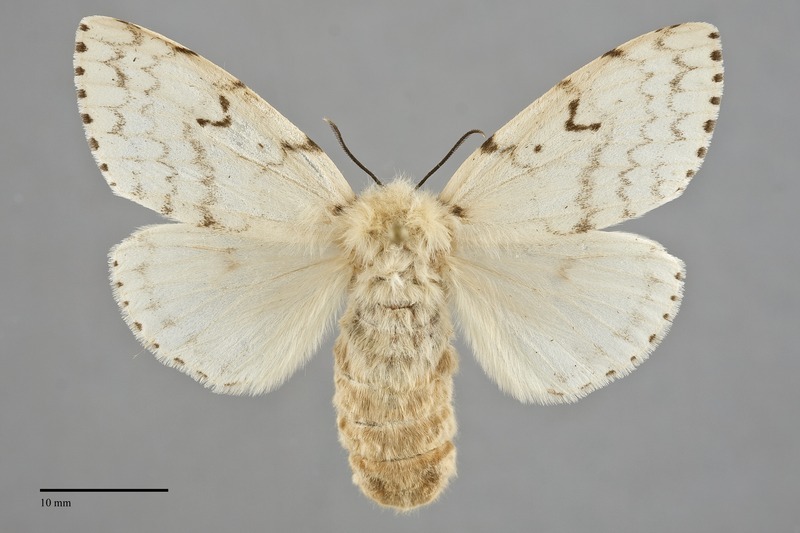 Lymantria dispar, the introduced Gypsy Moth, exhibits sexual dimorphism. Males are smaller with powdery dark to light brown forewings and warm brown hindwings, while females are larger, stout-bodied, and predominantly whitish (FW length 15–19 mm in males; 23–29 mm in females). The wings of the males are short, broad, and rounded, and those of the female are longer. Both sexes have dark forewing markings consisting of deeply scalloped transverse lines, a punctate orbicular spot, a crescent-shaped discal spot, and dotted terminal line, all of which can vary in prominence. The male hindwings have dark gray veins and ill-defined marginal band and a rusty fringe, while those of the females are nearly uniform cream. The body of the male are dark brown. Those of the females are cream and are disproportionately large for the size of the moth. The antennae are bipectinate, strongly so in males. 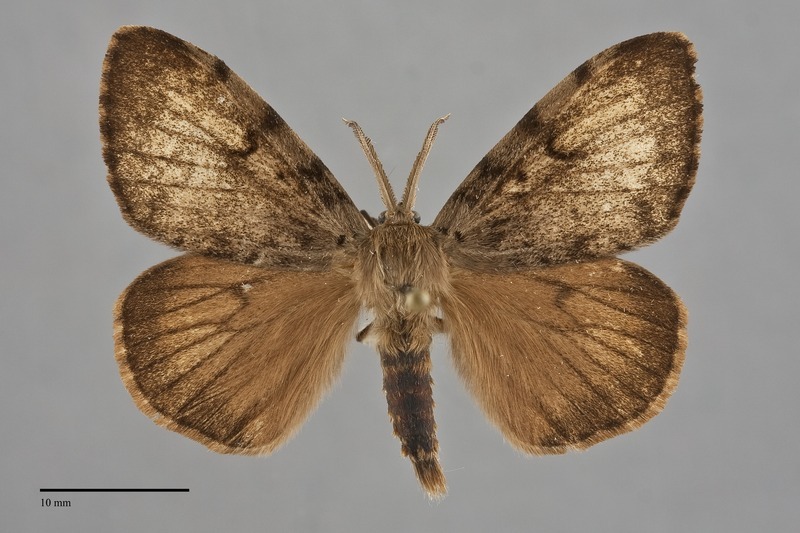 Males of the Gypsy Moth can be recognized by the combination of bipectinate antennae, gray-brown forewing with dark spots, and warm brown hindwing with darker veins. 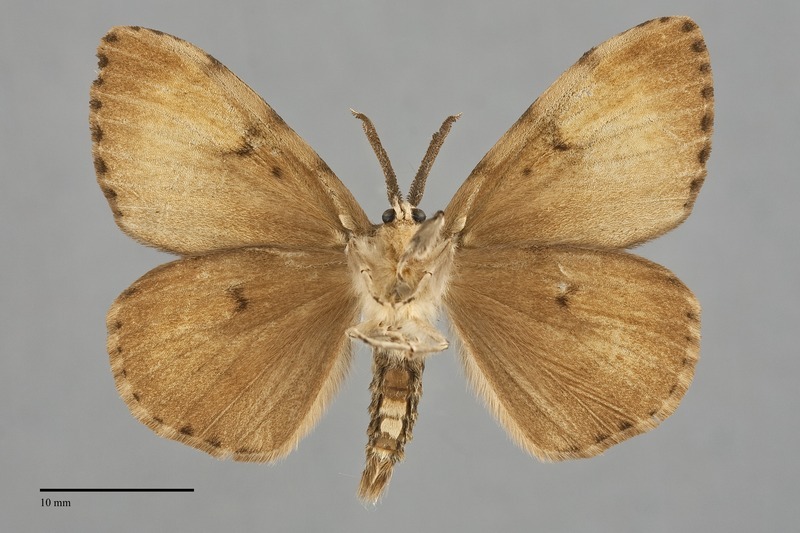 They are most similar in general appearance to males of tussock moths, especially Orgyia pseudotsugata and Orgyia vetusta, but are larger and lack a pale spot in the posterior subterminal area ("subanal spot") that is characteristic of the genus Orgyia. Females of L. dispar are distinctive due to their large body size, cream color, and dark forewing markings. The larva has lateral brown hair tufts combined with red and blue dorsal warts. It is illustrated by Miller & Hammond (2003). This species is an introduction from Eurasia that is now widely distributed in hardwood forests throughout eastern North America where it frequently expands into epidemic outbreaks that result in massive defoliation of forests. Some accidental introductions have come into the conifer forests of the Pacific Northwest, but these have all been successfully extirpated with pest control programs. 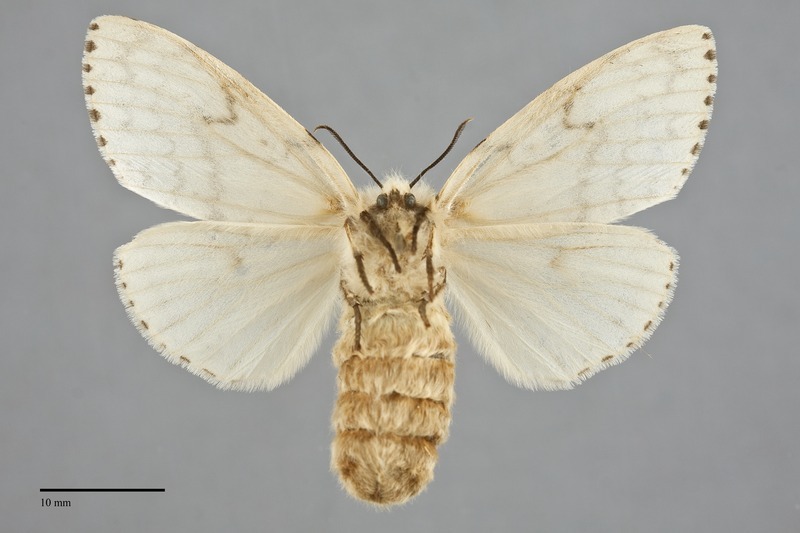 The Gypsy Moth was first established on the East Coast but reports of new populations in the Pacific Northwest have been reported in Washington, Oregon, and California. 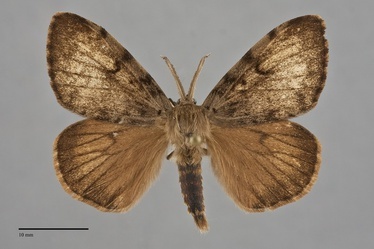 The number of introductions of this moth into the Northwest is underrepresented by the museum survey used to generate data for this website, especially in Oregon and British Columbia. More complete data for Washington has been provided from the trapping program run by the Washington State Department of Agriculture. This program uses female pheromone lures to trap males, and from the capture results, it is clear that most records are from the near the Puget Sound, with only a couple or records from the east side of the Cascade Mountains. This species occurs across boreal Eurasia. It has become successfully established in eastern North America. This species is a generalist feeding on a wide diversity of hardwood trees and shrubs as well as various conifers (Pinaceae). They particularly favor feeding on oaks (Quercus spp. ), but also use various other Fagaceae, Aceraceae, Salicaceae, and Rosaceae. In the Pacific Northwest, they have also fed on Douglas fir (Pseudotsuga menziesii). The young larvae disperse by ballooning, spinning silk thread that carries them on the wind. This species has only one brood per year and overwinters as an egg. Females have wings but are flightless in the European race, while Asian females can fly. This species is a major defoliator of commercial forests. Asian populations of L. dispar feed on both hardwoods and conifers, unlike west Eurasian forms introduced from the east that prefer deciduous trees, and are a serious threat to West Coast silviculture. Monitoring programs with pheromone traps are undertaken every summer throughout western Oregon and Washington in order to detect introductions at a stage when they can be eradicated. Spraying programs with the larval pathogen Bacillus thuringiensis are used to eradicate any detected occurrences.